3S can install and service fire suppression systems including clean agent, CO2, foam, and deluge systems. 3S Incorporated can specify, design, install and service a variety of fire suppression systems for the protection of your business and people. The suppression systems we install vary based off of your business needs. Each building can have multiple suppression systems based off the hazard and assets in a specific area. We provide clean agent suppression, high pressure and low pressure CO2, and water mist fire suppression systems to name a few! Our systems can be environmentally friendly and apply to LEED credits if needed. Our customers are always first and with that we are available for 24/hour service as well! With our consulting services, we can also help you with specification writing, bid management, code analysis and more. 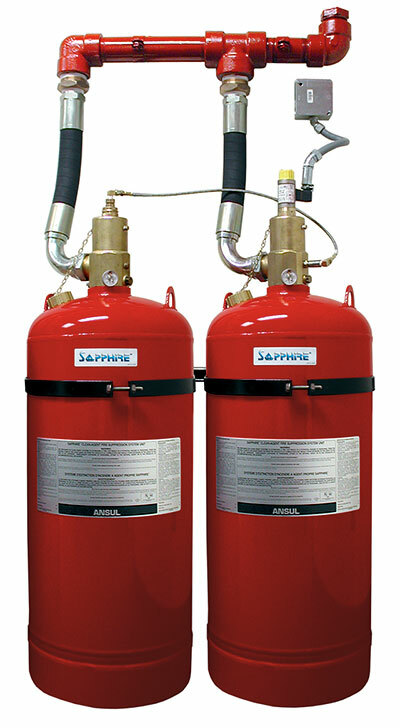 Don’t know what fire suppression system you need? Our NICET certified design team can help you to determine the best system for your industrial application. 3S can custom design a suppression system to any application and hazard. We take pride in designing the right system that many of our competitors will shy away from. 3S is innovation in industrial fire suppression system design. Request a quote today! Clean agent fire suppression systems are great for computer rooms, records and reference material, data centers, control rooms, museums, art galleries and other areas with sensitive materials and equipment. If you are looking for fire suppression systems for turbines, generators, flammable liquid storage areas, electrical substations, mill equipment, printing presses, hydraulic rooms, furnaces, CNC machines, environmental test chambers or engine test cells a CO2 fire suppression system would be a good option. Clean agent systems and CO2 systems are great for the speed in which they respond to a fire, helping you reduce the cost of damages. Without the use of water, clean up and return to full production is quick. Water mist fire suppression systems are excellent substitutes to traditional CO2 applications with the added benefit of being safe for personnel and environmentally friendly. Dry chemical fire suppressions are used for small paint booth applications, flammable material loading areas, off road construction or mining equipment applications. Once a system is designed and installed for your specific needs, we offer ongoing inspection services based off of the codes and regulations your need to follow. We also provide ongoing general maintenance service and a 24 hour response team for all of your emergency needs. 3S can be an extension of your operations team! Please ask about our custom enclosure design and assembly for hazardous and industrial areas! We can install and service all major manufacturers’ fire suppression systems. Listed below are some of the manufacturers we represent. We provide our customers with a custom quote for each project. With a request for quote submitted we will take the time to provide pricing and drawings for the system layout and suppression systems quoted. We can service customers across the U.S., Mexico and worldwide. As needed, we will coordinate site visits to gather project specifications to provide the most accurate project proposal. Visit our project gallery to see examples of our work or contact us to learn more about our experiences with commercial and industrial fire suppression systems.